In 2017, energy consumption in the European Union (EU) continued to increase for the third consecutive year, thus moving away from the energy efficiency targets. Primary energy consumption amounted to 1 561 million tonnes of oil equivalent (Mtoe), while final energy consumption reached 1 222 Mtoe. Compared with last year, both levels increased by around 1%, informed Eurostat. These figures are issued by Eurostat, the statistical office of the European Union, and are complemented by an article on energy saving in the EU. 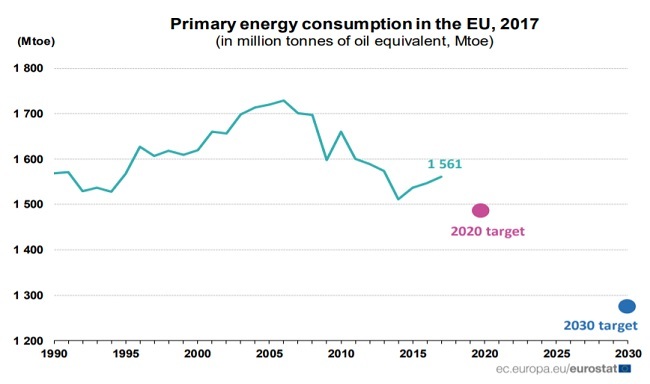 In 2017, final energy consumption in the EU was 3.3% above the efficiency target for 2020. Final energy consumption in the EU peaked in 2006 (1 195 Mtoe) and decreased by 0.6% p.a. between 2006 and 2017 (1 122 Mtoe). 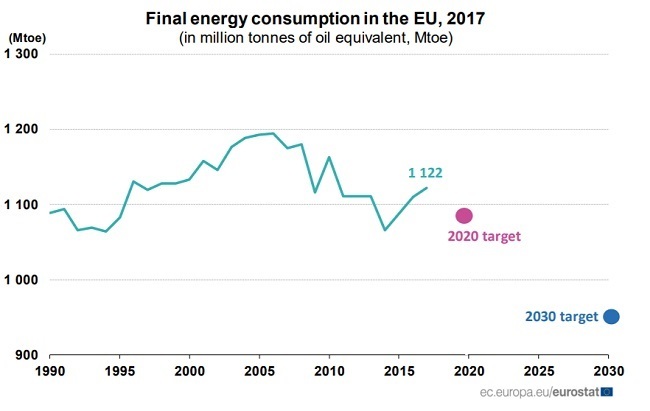 Since the beginning of the new millennium, the lowest level of final energy consumption was recorded in 2014 (1 065 Mtoe, 1.9% below the 2020 target). In the last three years, it has increased again to 1 088 Mtoe in 2015, 1 110 Mtoe in 2016, and 1 122 Mtoe in 2017.